Wales manager Gary Speed says plans for a £4-5m national football training facility at Newport International Sports Village are "essential". 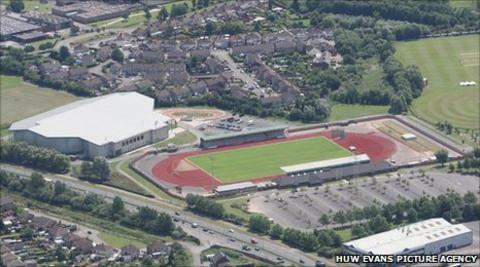 The Football Association of Wales, Welsh Football Trust and Newport City Council aim to build the venue. The centre would develop the under-21, women's and younger age-group squads. "We are a small nation and we need to develop an identity and our way of playing to ensure our success in the future," said Speed. "When players come here at an early age, hopefully they get a taste of that identity and hopefully they can develop the Welsh way of playing. "For a relatively small nation in terms of resources and population, I think it's essential to have a centre like this." The site already houses a velodrome, cricket and indoor tennis centre and is also home to Newport County FC, who play their home matches at the athletics stadium. Part of the plans also create another facility for the senior squad, who could move from their current base at the Vale of Glamorgan in Hensol. "I think that depends on what happens over the next few years," added Speed. "It's obviously an option for us. "At the moment we've got a great facility at the Vale Hotel and we're very, very settled there, but in years to come it could be an option for us to train here." Speed is hoping the four-pitch facility will breed players of the future and ties in with their mini-football campaign which is aimed at providing youngsters with a strong footballing education. Welsh football has suffered on the pitch for a number of years and is not producing the amount of quality players the FAW would like. Tottenham Hotspur winger Gareth Bale and Arsenal midfielder Aaron Ramsey are the only players in the last few years to have broken through at the top of the Premier League. Wales' poor show in the 2-0 defeat by England on 26 March ended their hopes of qualifying for Euro 2012 in Poland and Ukraine in Speed's first game in charge. But it highlighted the stark contrast in standards between the Wales team and the England team, which is full of Premier League stars. While the development is being roundly welcomed, it will be dwarfed by England's £100m national football centre being built at Burton-on-Trent. The first phase of the Newport development is expected to be ready within 18 to 24 months, and has backing from Uefa and Fifa who are pledging up to 3m euros to help build it.